Mouflon (Ovis aries musimon) Originally found only in Corsica and Sardinia, but was introduced in many parts of Europe, on the beginning of the twentieth century in Poland. The smallest representative of the wild sheep. Mouflon have a red-brown short-haired coat with a dark back-stripe, light colored saddle patch . Males are horned (some females are horned while others lack horns). The horn is curved in almost one full revolution (up to 85cm). 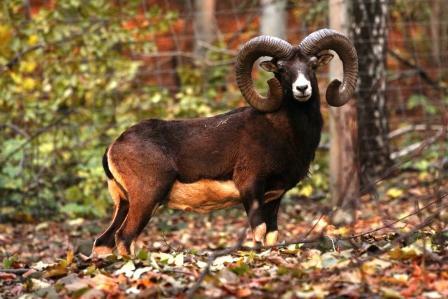 Mouflon have a shoulder height of about 90cm and weights 50 kg (males) and 35 kg (females). It lives in small flocks sometimes quite numerous. Older rams lives alone or in small groups. The diet is dominated by grass, herbs, nettles, berries, leaves, shrubs. Rutting season falls in November, December. Between rams comes to fights. Gestation takes 5 months. Sheep in March or April gives birth to one, sometimes two lambs. About news in the park you can read on our profile on Facebook.